Tumors of the pineal region account for just 0.5 percent to 1.6 percent of human brain tumors. Several different types of tumors that arise in the area of the pineal gland, requiring different treatments. The exact diagnosis is critical for choosing the correct therapy. Account for more than half of all pineal region tumors. 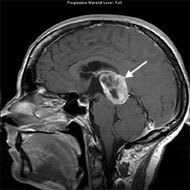 Pure germinomas account for 65 percent to 72 percent of all intracranial germ cell tumors. Germinomas have indistinct boundaries and often seed the ventricular system, which contains cerebrospinal fluid (CSF). The embryonal cell carcinoma, which is the least frequently reported intracranial germ cell tumor, is rarely found in its pure form and is usually highly malignant. Endodermal sinus tumors are rare and highly invasive. Teratomas can be either immature or mature and represent the expression of embryonic differentiation in germ cell tumors. These tumors are usually well formed, round or lobulated, and multicystic. They compress surrounding structures. Account for 20 percent to 30 percent of all tumors in this location. Two types -- pineoblastoma and pineocytoma -- differ by appearance, level of differentiation, and degree of malignancy. Pineal tumors typically present with hydrocephalus, a build up of CSF pressure within the brain. A team of experts is needed for optimum therapy. UCLA experts in neurosurgery, neuropathology (microscopic diagnosis), radiation therapy, and oncology will work together to provide the best and latest therapies. Symptoms arise when the tumor invades or compresses adjacent structures. The manifestations depend on the size of the lesion and whether it is an invasive tumor. The involvement of the cerebral aqueduct causes hydrocephalus and increased intracranial pressure, commonly resulting in headaches, nausea, vomiting, lethargy and altered mental function. Involvement of the superior colliculus causes visual problems. The most common is Parinaud's syndrome, which includes inability to look upward, double vision and nystagmus, or flickering of the eyes back and forth. Invasion of the thalamus can cause loss of sensation to half the body, weakness of half the body and intermittent pain. Invasion of the hypothalamus may cause disturbances in body temperature and water regulation, sleepiness and weight gain. Additional symptoms include memory problems, lack of coordination and tremor. A computed tomography (CT) scan of the brain may be helpful to see if the tumor is calcified. Both MRI and CT scans assess for the amount of hydrocephalus. In many cases, a biopsy is required to determine the tumor type. More than a dozen different types of tumor occur in this region. UCLA neurosurgeons have expertise in minimally invasive techniques (endoscopy or stereotactic needle biopsy) for obtaining biopsies. In many cases, stereotactic radiosurgery can provide excellent control of pineal tumors. UCLA uses the advanced Novalis shaped-beam stereotactic radiosurgery system, which is equally or more effective than Gamma Knife.